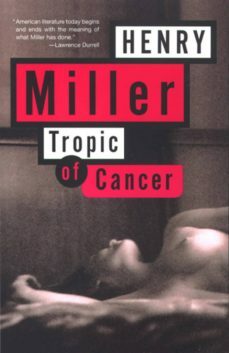 Tropic of Cancer is now considered, as Norman Mailer said, one of the ten or twenty great novels of our century. Now hailed as an American classic, Tropic of Cancer, Henry Millers masterpiece, was banned as obscene in this country for twenty-seven years after its first publication in Paris in 1934. Only a historic court ruling that changed American censorship standards, ushering in a new era of freedom and frankness in modern literature, permitted the publication of this first volume of Millers famed mixture of memoir and fiction, which chronicles with unapologetic gusto the bawdy adventures of a young expatriate writer, his friends, and the characters they meet in Paris in the 1930s. Sin ningún tipo de tapujos ni tabues Miller relata aquí sus vivencias parisinas; la indolencia, la desidia, el hastío por una sociedad que considera enferma, tal vez más que él mismo, tal vez tan al borde del abismo como él en su propio precipicio. Tarde o temprano hay que leerla.